Online shopping has been integrated into our daily lives. Sure, the milkman once brought milk to our doors, but doorstep delivery is now as boundless as our imaginations. Is your website enabling you to be as competitive as you could be? Ecommerce Tip: If you have what people are looking for, they will buy from you online as long as you enable a smooth virtual shopping experience. 58% like getting offers on their mobile phones. There is no longer a question of whether there’s an audience for an online store; it’s only a matter of building an ecommerce website with the right development, design, and communication strategy to take advantage of the digital marketplace. Of course, marketing is an entirely different conversation. Sure, there are the big dogs like Amazon and Google Marketplace out there, but the beauty of the internet is that anyone can compete. There’s the decision of what ecommerce framework to use, but building a successful store goes far beyond this first step. 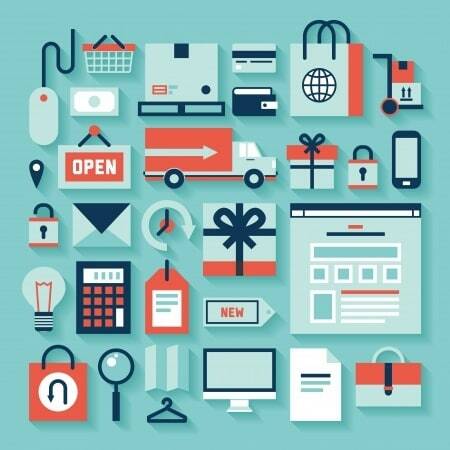 What can today’s online retailer do to make the most of their ecommerce website? Maximize your customers’ experience. The world may be more comfortable with online shopping these days, but as an internet retailer, you still have the disadvantage that no one can physically examine your products. Fill this void with detailed product descriptions and additional bullet points detailing specifications at a glance; utilize high quality photos, and integrate videos such as product demos; enable product reviews; always think about how you can give your customers more. Establish your brand identity. From your logo and color scheme to your language use and total website design, every decision you make sets a mood and establishes your company’s personality. How do you want your visitors to perceive you? The voice you choose and tone you strike should be consistent throughout. These are the first steps to building a connection with a customer. Be professional and unique. Build Trust. People don’t give their credit card information to people they don’t have confidence in. There are many ways to build that trust, but you should start with including company contact details in an easy to find location and telling your company story. Assuring privacy and security is essential. An Extended Validation Secure Sockets Layer (EV-SSL) certificate, which customers recognize when they see a green bar or a green lock in the address bar of a secure website, is also an important step for any online retailer. Enable easy search-ability. Whether people come to your ecommerce website just to “browse” or whether they are looking for something specific, you should do everything you can to make their hunt a simple process. Place the search bar in a clear location (perhaps the top right) on every single page; suggest similar or complementary items to the one a visitor is looking at; use corrective searches that offer possible spelling suggestions rather than an error message; separate products into logical categories, and enable search within each category. Be mobile-friendly. Online shopping isn’t just happening on desktop computers, so make sure every customer can have a straight-forward experience, no matter what device they are using. Responsiveness is vital for websites these days. You don’t want to lose a possible sale because your online store doesn’t work on a smartphone or tablet. Optimize the checkout process. Don’t let your potential customers fill up their shopping carts only to stop due to complexities or confusion. Make the checkout steps clear with a progress indicator, and enable customers to navigate backward or forward easily during this process; design all information forms with simplicity in mind, asking only for necessary information and making entry errors understandable; offer “guest check-out” for customers who do not want to register before their purchase; provide a clear order summary before the final purchase and a clear order confirmation afterward. Go above and beyond. People remember quality service. It’s the little conveniences and special add-ons that bring them back for more just as much as the quality products that they purchase. Invest in solid customer service; offer a same-day shipping option or free shipping; provide gift wrapping; communicate with professionalism and personality. There are moments when visitors are just browsing, and there are moments that a well-designed store—physical or virtual—can hook them into becoming paying customers. Does your store measure up? It’s time to take it to the next level.